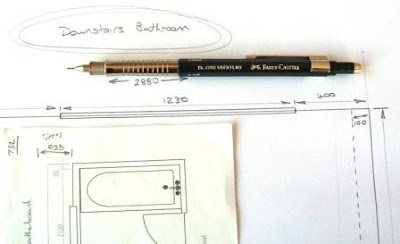 The TK-Fine Vario L is Faber-Castells top of the line offering in technical or draughting pencils, and judging by comments and emails I have received over the corse of this blog, it certainly has its share of fans. I first thing that struck me when I picked up my TK-Fine Vario L was how light it was. The kitchen scales make it 15grams. From its length and amount of metal componentry I just expected something more weighty and substantial in the hand. Having said that, the metallic componentry is mostly at the front end so it does have a reasonably front-heavy balance. The other first impression I get from this pencil is its overall “look”. It looks quite good – a long, slim, technical appearance. It also looks “well made” – the metal and plastic components all look like they are good quality items, that this a pencil that was made to last. Mr Penny-Pincher was not involved in its manufacture. No one would be surprised to see this pencil in the hand of a prominent designer. But it is also a rather dated appearance, a sort of 1960’s or 70’s industrial look, although some might suggest that is actually also a rather current look. I must also say that one time as I was looking down the length of the pencil I was suddenly struck by the similarity to a Sky Tower type building. The looks grew on me even more after that architectural revelation. The lead sleeve is a 4mm metal tube for draughting work. It isn’t retractable. This pencil is super pocket unsafe. The tip section includes a lead hardness indicator window. 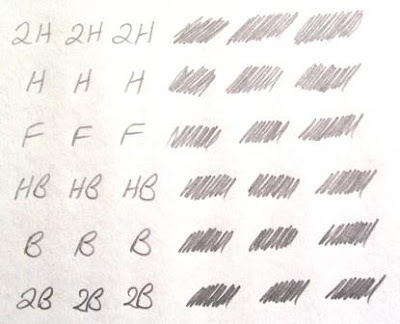 You can rotate it around to show 2B to 4H, including F. Personally I think this hardness indicator is at the wrong end of the pencil. 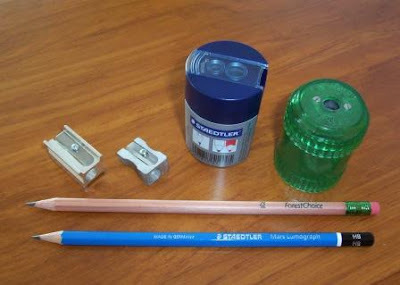 If you have a couple of pencils loaded with different lead grades and store them in a cup or holder point down then you can’t tell which is which until you pull it out of the cup. I also tend to find the indicator a little distracting in general use, as its right down there in the line of sight of the tip as you write or draw. 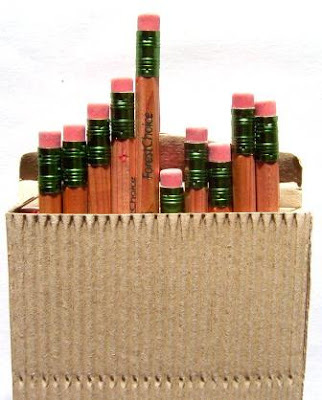 However, others may argue you should store your pencils upside down to protect the long thin lead sleeve from damage. If that is your practice, then the indicator is correctly positioned. OK, well up at the other end of the pencil there is a twist out eraser. The twist action is very smooth and easy, and the eraser is a little under 4mm diameter with about 26mm of usable length. The compound appears to be vinyl and erases quite well. The thin diameter means you can do some reasonably detailed fine erasing, but the compound does seem to have a slightly annoying habit of sticking to the paper. 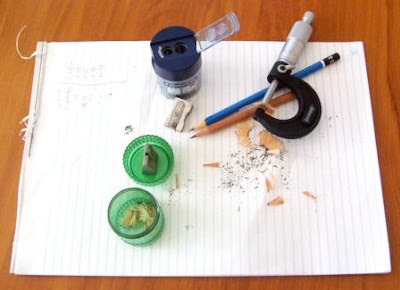 As the top of the pencil, the eraser cartridge is also the push top that activates the ratchet lead advance mechanism. It is a very positive noisy ‘clicky’ type, 10 clicks will get you 7mm of lead. My pencil is a 0.5mm model, but 0.3, 0.7 and 0.9mm are also available. You pull the whole eraser cartridge out of the body to access the lead refill magazine. The metal pocket clip is quite stiff but functional. Perhaps the TK-Fine Vario L’s main point of difference is its rather unusual adjustable lead cushioning system. You hold the metal grip section and twist the body one way for the “hard” setting and the other for the “soft” setting. On hard setting the lead is rigid, but on soft setting there is several millimetres of spring loaded retraction up into the lead sleeve if you push down hard on the lead. The theory is that this cushioning reduces lead breakages, etc. I’m not entirely convinced by this variable cushioning feature. When set to soft, the amount of lead movement sometimes seems excessive. I’m tempted to think this is all a bit pointless, just a marketing ploy, that a standard “fixed” cushioning system, or even no cushioning, would have been fine. Call me crazy, but I also thought there was a little bit more sideways play in the lead on “soft” setting than on “hard”, but someone will probably tell me that’s impossible. The upper part of the body is a hexagonal plastic section, but the lower part is a nice round cross-section shiny metallic (chrome?) grip zone. It has some shallow circumferential grooves cut into it and flares out slightly at the base. The grip section is about 8mm in diameter which is relatively thin. Back at the beginning of this review I said, “...and judging by comments and emails…it certainly has its share of fans.” Well, unfortunately, I’m not really one of them. I’m afraid that in my book, the grip section is a complete let down, and ultimately ruins this pencil for me. The small diameter and shiny surface somehow combine to produce a very unsatisfactory insecure slippery grip. Faber-Castell have manufactured this pencil for a very long time so it must be a successful seller and many will disagree with my assessment, and maybe I am going overboard here, but this is the worst grip I have used in a very long time. Sorry, but that’s my personal opinion. I’ve got other plain shiny metal pencils, but they tend to be fatter. I think the problem is the combination of thin pencil and shiny metal grip. Best Points – the looks, the eraser. Dimensions – Length 154mm, diameter 8mm at grip section. Balance point about 65mm up from the tip. Well my last posting included the Onoto advertisement, so I should have put up something about the two Onoto pencils that I have. I’m afraid I know very little about them. I suspect they date from around the 1950’s, which is toward the end of Onotos existence. The web tells me that the printing and stationery company, De La Rue, started making fountain pens in 1881 and used the brandname “Onoto”, but ceased production in 1958. De La Rue continue today as the worlds leading maker of paper for, and printer of, banknotes; as well as being involved in supplying other secure documents like passports, travellers cheques, postage stamps, etc. Both my Onoto pencils are shortish, at around 11.5cm or 4.5 in. The first is a basic simple looking plain black with gold trim model. A traditional classic? The metal is showing a bit of wear and loss of plating. The plastic body is generally in better shape than the metal trims. “Onoto” is stamped into the pocket clip, but there are no other markings. Overall though it is in pretty good condition for something thats over 50 years old. 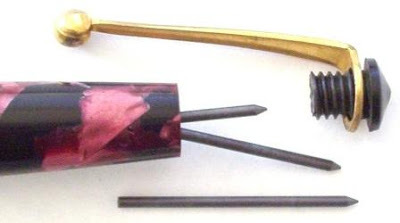 The second pencil is a little more picturesque, a light and dark sort of pink burgundy marble with gold trim. 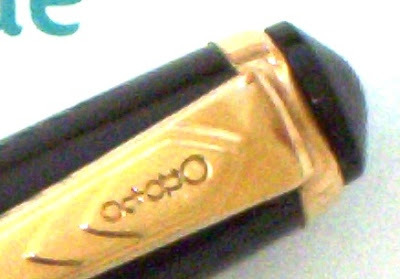 The company logo is stamped into the pocket clip, but this time the wording “Onoto The Pencil” and “Made in Gt Britain” is stamped into the plastic body. The marble effect is quite nice, with flashes of an almost silver effect at certain angles. The lighter sections give an appearance of real “depth”. Both pencils are tip twist mechanisms to advance and retract the lead. The lead is 1.18mm and spare leads are stored loose inside the body. You unscrew the little top cap holding the pocket clip to access the leads, and feed one new lead into the tip. No auto-feeding like todays modern push-top ratchets. Also you can see how short the old style leads are, just 25mm or 1 inch long, and they have a sharpened tip. The sharp eyed amongst you might have noticed the background to the photo above is the letterhead of the Inland Revenue Department. That letter was just sitting there when I went to take these photos and somehow, I imagine the taxman of old was likely to have been an Onoto type of guy, signing all those officious demanding letters that brought sorrow and dismay to the recipients. You may also note the words 'Te Tari Taaki' below Inland Revenue. Here I go again, meandering off-topic, but anyway… as part of the campaign to maintain the “health” of the Maori language (Maori are NZ’s indigenous people), the government entities all have dual English-Maori names. Many of these names make great translations. Historic Maori has no words for many modern societal and technological terms, so there have been some very creative creations. Now I don’t speak Maori at all, and a basic dictionary translation of these particular three words is quite difficult, but would suggest the Maori version literally translates as something conceptual like “The Department for Taking Personal Things from Below, in an Upwards Direction”. The truth is out! It is just the big guy on top takes it from the little guy down below! 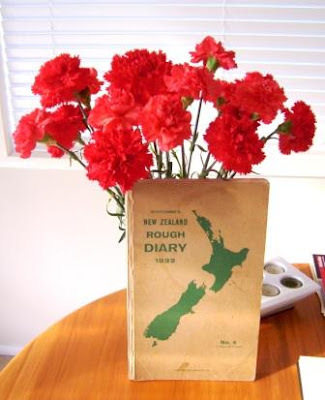 Here we have the “1932 New Zealand Rough Diary”. Don’t ask me what a “Rough Diary” is, it seems to be a reasonably normal sort of large desk diary to me. No idea what the “Rough” bit means. Somewhat larger than A4 size, it has stiff cardboard front and back covers, is printed 1 week per page, with a blank pink page in between every printed weekly page. I bought this diary in an online auction because it contained advertisements for pens and pencils. I’m very pleased with the ads, they are great, but I got so much more than I bargained for. Despite the seller being in a small provincial city about a 6 hour drive away, the diary entries clearly indicate the original owner lived right here in my neighbourhood. Furthermore the diary has 27 pages chock full of old time information. As well as the usual yearly calendar with sunrise, sunset and phases of the moon, we have various “ready-reckoner” tables like the ‘Lamb & Sheep Table’ used ‘To ascertain the value of lambs per head at a given price per pound’. This was back in the days of pounds, shillings & pence, before decimal currency, so working things out was a bit complicated. However, I now know that if my lamb weighed 34 pounds and was worth 7 and 5/8 pennies per pound, then overall my lamb would fetch 21 shillings 7 and ¼ pence down at the local saleyards. The ‘Wage or Income Table’ tells me that if I earned 8 and ¼ pennies per day, then that was 4 shillings 10 and ¼ pence per week, or 1 pound 1 shilling per month, or 12 pound 12 shillings per year. This diary is from 1932, when the Great Depression was still in force, and money was tight. You can see that many of the pages were used over again by changing the year – with a pencil of course! The many pages of the Legal Information section advise the reader that “The Unemployment Act, 1930, is designed to meet the unemployment problem, which, as in other countries, has grown rapidly and beyond the power of our charitable relief organisations to deal with.” Later we read “The Mental Defectives Amendment Act, 1928, has effected certain reforms in the law”. Amongst these various reforms are regulations that “The supply of intoxicating liquor to mentally defective persons, except on the advice of a medical practitioner, is made an offence”. Much detail is also given on the registering of births, deaths and marriages; and the methods of “Legitimation” of any child born before the marriage of his or her parents. The phrase “carnal knowledge” gets used rather frequently. The large Government section of the diary lists all the various government departments and offices, etc. I scanned the list of the Members of Parliament for names I knew. There were a few, including “Fraser, P.” As a young radical militant socialist, Fraser was imprisoned in World War 1 for opposing compulsory military conscription. In World War 2, Fraser had risen to be Prime Minister of New Zealand and as an opponent of fascism would introduce compulsory military conscription. Just a little bit of a U-turn! 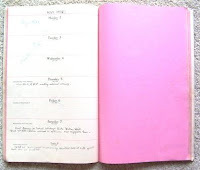 Anyway, this diary is a great little glimpse back in time for a person like me with an interest in history, but enough of that, this is a pencil blog! In the diary there are several advertisements related to writing - full page ads for ‘Onoto’ pens, for ‘Swan’ ink, for ‘Eversharp’ pencils, for ‘Multyplex’ typewriter ribbons, for ‘Multyform’ typewriter carbon paper, and lastly for the ‘Leada Loose Leaf Ledger’. I’m only going to feature two of these – the Onoto and the Eversharp ads. First up then is the Onoto advertisement. Now I’m no expert, but a quick browse of some fountain pen sites implies that Onoto de la Rue were one of the serious heavyweight prestige brands of their day, arguably the most prestigious of the British manufacturers. I’ve actually got one or two of their pencils so I will have to dig them out sometime soon and post a photo or two. 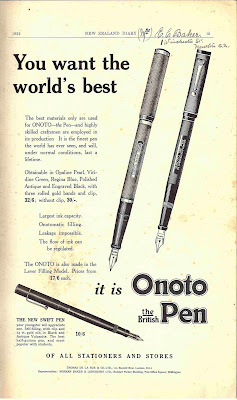 The advertisement proclaims Onoto the British Pen as “…the finest pen the world has ever seen…”. This pen is advertised at a price of 32 shillings and 6 pence, which I believe is a little less than 1 weeks “average wage” for the time period. I’ll leave you to work out the comparison with todays average wage and the pricing of Mont Blanc and other premium pens. This image is full resolution so you can click on it to expand and read the full text. Sorry - some Blogger "known issue" is preventing me from uploading a full resolution photo. Well I’m starting this review off with a bit of a ramble. Judging from the requests to review this particular pencil, rarely has a mechanical pencil review been awaited with so much anticipation. Amongst the mechanical pencils that I own, the Pilot Clicker has one claim to total uniqueness. Here’s why. I own a few mechanical pencils. Quite a lot actually. Now what happens is that sometimes my pencil goes missing, and shortly thereafter I find that my wife has appropriated it because “it looked interesting”, or nice or something. Now she’s not a pencil nut like me, and it’s my pencil, so I just take it back off her. It’s mine! But hey, I’m not totally heartless, I’ve bought her a couple that she said she really liked (e.g. Lamy Scribble) so that she didn’t have to keep stealing mine. But you know, it doesn’t really work like that. The grass is always greener on the other side of the fence, and my pencil is always more interesting than hers. So she keeps taking them. Except there was this one day I saw she was writing with a pencil I didn’t recognise. It was a Pilot Clicker. I had never seen one before, and Pilot pencils are quite uncommon around these parts. So apparently it had just been sitting around abandoned at her work for quite some time and she just claimed it. Right, well, the roles were reversed, so this time her pencil just “went missing”. I own two Pilot Clickers, both 0.5mm lead, one is red and labelled a Pilot HCK-50R-R5, the other is black and labelled H-545-B. Apart from the colour and the label I can’t see any difference between them despite their seemingly different model designations. Probably just old and new, or different codes in different countries. One of the first things you notice about the Clicker is that big sliding eraser mechanism. You just push in and slide the button up to advance the eraser out. It appears to be a vinyl eraser, but perhaps with a fair amount of fillers as it’s very slightly rough to the touch. In use it is quite an effective eraser, although not quite as good as the trusty Staedtler Mars Plastic. The waste does twist up a bit into strands for easier cleaning. Overall there is about 28mm of usable length of 7mm diameter eraser. 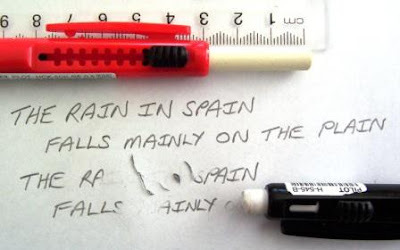 The slider generally locks into place and doesn’t slide back into the pencil body when you are using the eraser. Another obvious feature of the Clicker is the long black rubber grip section, basically covering the whole bottom half of the pencil. Its not a particularly “grippy” compound, it’s not contoured (except for a minor flare out at the tip), and it’s a fairly hard compound so there isn’t much give under normal finger pressure. So, overall it’s one of those rubber grips that leave me a little confused. Why did they bother? Is it just a current fad – “rubber grip = better”? One thing about the uncontoured grip though is that it does allow you to grip the pencil down low or higher up. Towards the top of the rubber grip is the side push button to activate the lead advance mechanism. Pilot have done a good job with this button. It is attractively accentuated by the coloured surround, the button itself is not too obtrusive, and it is well positioned so that it is easily activated by your thumb or finger whilst writing. The mechanism advances 6mm of lead for 10 clicks. You pull the top half of the body off, and then pull a little end-cap off, to access the lead refill magazine. The tip of the pencil is chrome, and the lead sleeve is a short little non-retractable cone. I would have preferred it to be retractable for pocket safety as this is a general writing pencil. The integrally moulded pocket clip is a fairly solid sturdy type. We all know I’m not really a great fan of rubber grips and side button mechanisms, but overall the Clicker isn’t too bad. The aesthetics of it have definitely grown on me over time, the eraser is quite handy, and you can tell the designers put a bit of effort into the whole thing. So, if you don't share my aversion to rubber grips and side-buttons, then the Pilot Clicker is worthy of your consideration. Not So Good Points – The rubber grip seems a bit pointless. 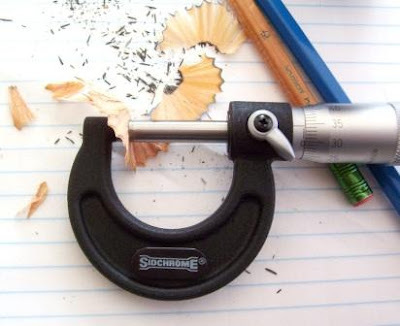 Dimensions – Length 144mm, diameter 11mm at grip section. Balance point about 65mm up from the tip. Note: Not sure, but I think the Clicker is on the way out, being discontinued by Pilot, at least in some markets. OK, I have reset the publish date on this posting to promote it to the top again. Overall I've been pretty happy with my match score predictions so far. However I got the results of Pool D, the so-called "Pool of Death", wrong. I picked France to win and Ireland to come second, with Argentina, Georgia and Namibia thus being eliminated. However, I seriously understimated Argentina, and over estimated France and Ireland. So, with Argentina winning, and France runner-up, Ireland have been eliminated and the All Blacks will play France in the quarter-final. This is a concern, as us Kiwis are permanently worried by Gallic unpredictability. The day is finally here. The Rugby World Cup starts in France, in just under 90 minutes time. Time to put a stake in the ground and make a prediction. So here's my version of the future for my team. NZ beat Ireland, 50 - 10. NZ beat Australia, 35 - 24. NZ beat South Africa, 27 - 23. Well, thats how I see things going anyway. Time will tell. Straight out of the starting blocks, Pentel established a good lead. After just one day of votes, the top five were (from 1st to 5th) Pentel, Faber-Castell, Caran d’Ache, Staedtler and Papermate. At the half-way stage it was Pentel, Caran d’Ache, Pilot, Faber-Castell and Some Other Brand. In the end Pentel was the clear winner, which doesn’t surprise me at all. Two things did surprise me though. First was that Uni (Mitsubishi Pencil) got zero votes, and that Some Other Brand got 9% of the vote, and was actually the fifth highest scoring selection. This tends to indicate I got my selection of voting options wrong. If you voted for Some Other Brand then feel free to leave a comment and let me know who you voted for. Mont Blanc, Retro 51, Bic, Pelikan, Alvin, Standardgraph, Cross…? I think that’s it for polls for the meantime, unless I think of some other question I just have to ask. This is actually a posting that isn’t; an idea that didn’t work out. Still, it seemed like such a good idea at the time, that I feel compelled to write something, even if it’s basically nothing. Understand? One day a thought popped into my head, “Just what pencil does Uncle Sam use?” Even better, “What mechanical pencil does the US Army use?” Surely there was a story here. Well it turns out that as far as I can tell (from a long way away), there isn’t really any story here. From a few US folk I’ve asked, and the little I could find on the web, it appears that these days things have changed, that the Army doesn’t do big national deals on this sort of thing. They pretty much shop where you and I do, but they probably get the big bulk-buyer discount price, although apparently there are some nifty army camouflage pencils. But basically no story here. Major-General Horatio Gordon Robley, the “Soldier with a Pencil” who served with the British Army here in NZ in the mid-1860’s during the New Zealand Wars. He made many finely detailed drawings of colonial and Maori life which are an important historical archive. 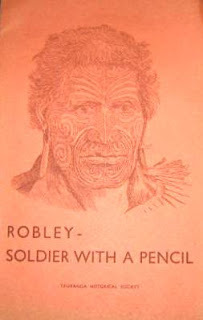 This is the front cover of a small publication of some of his drawings - it’s the facial tattoo of a Maori chief. Another link I liked was of a comic story from the trenches of France / Belgium in World War One. A little light-hearted NZ colonial humour directed at the ‘superior minds’ of the (British) commanders, with their fancy pencils, multiplication tables and ready-reckoners. It appeared that he was busy with a report to the Corps Commander. His pencil was working furiously. The problem was this: If two mules can draw two hundredweight of paté de foie gras on a trench tramway two feet wide with a grade of one in a hundred on a curve of one in fifty as laid down by a New Zealand engineer, what will be the weight of the two mules and the name of the muleteer? "Upon the solution of that problem," whispered the orderly, “will depend the feeding and the equipment of this Army for the next three years." 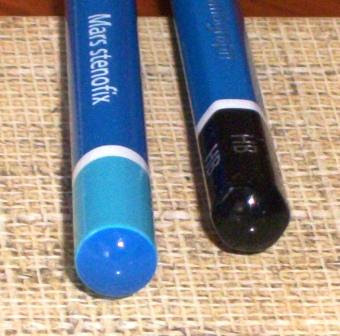 In the 2006 Lead Cup, Staedtler Mars Micro Carbon Leads were eliminated in pool play - they had a tough draw as the eventual Cup winner, Pentel Ain, was in their pool. Staedtler finished second in their pool but missed out advancing to the next round on a points count-back. Here in my part of the world Staedtler leads are quite common, so a review seems in order. Currently the Staedtler website lists the following size and hardness options for Mars Micro Carbon leads. 0.3mm = B, HB, H, 2H. 0.5mm = 2B, B, F, HB, H, 2H, 3H. 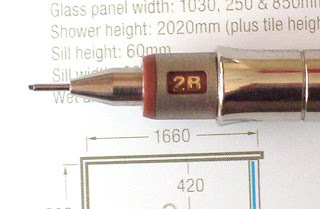 0.7mm = 2B, B, HB, H, 2H. For the purpose of this review I’ll be sticking to 0.5mm, 2B to 2H as per the line up below. Mars Micro Carbon leads come in clear plastic rectangular container of 12 leads. They have a simple push fit stopper, which once removed allows the leads to pour out. The idea behind this is that many of the Staedtler mechanical pencils have lead refill magazines that will take 12 lead refill sticks at a time and the neck of the tube fits into the top of the pencils refill magazine, making for a quick easy top up. The size label is colour coded to match the lead magazine on Staedtlers pencils, e.g. 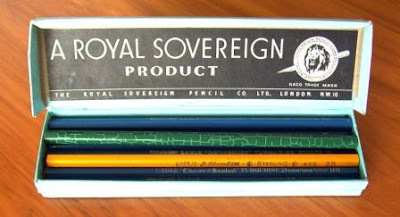 note how the “0.5mm H” part of the label is a reddy-brown colour, and Staedtlers 0.5mm technical pencils all have that same colour lead magazine. 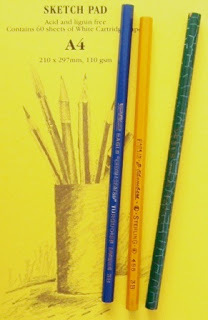 For 0.3mm pencils and leads the colour is yellow, blue for 0.7mm, etc. 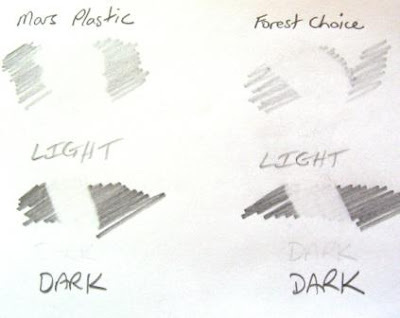 This is all according to an ISO standard for the colour coding of drawing instruments by line widths. The refill tubes and their labelling are clean and functional, but nothing “fancy” in comparison to some of their (Asian) competitors. The reverse side has a barcode and some recycling symbology. I note that they all state “Made in Germany”. Now it’s time to put graphite to paper, try a few things and do a comparison or two to the reigning champions, Pentel Ain. The very first thing I noticed was the lead diameter issue covered in my earlier posting. These Staedtler leads certainly are prone to sliding a little bit through the mechanisms of some non-Staedtler pencils. Let’s have a look at the blackness range of 2B through to 2H. As usual, it’s rather hard to tell one grade from the next one on the scale, but you can see a difference over the full spectrum. One thing I did note was that H definitely felt harder than 2H when I was writing with it. HB was the first grade that felt “smooth”. The harder grades all felt “hard”, you could feel the paper grinding lead off the stick. HB was the first grade that felt smooth. So, there was a clear difference in the “feel” of the lead when changing from F to HB. There was also a noticeable change in feel from B to 2B. Now let’s do some comparison to Pentel Ain. Ain 2H is definitely harder than Staedtler 2H, though there is not really any difference in blackness. 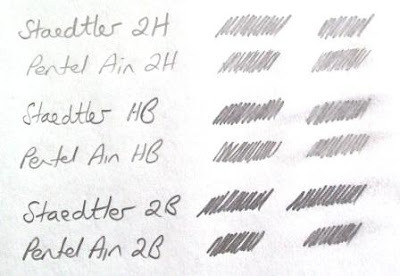 In HB the two brands are fairly similar in hardness, but Staedtler is slightly darker. The story is the same in 2B. 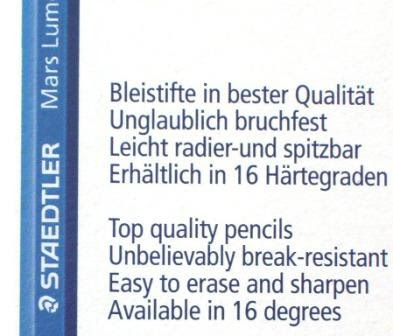 One would assume that Staedtler would tailor their Mars Plastic eraser to suit their pencil leads. So, onto a spot of erasing. Well both 2H’s erased easily and completely, but afterwards you could clearly see how much more the Ain 2H had indented into the paper. There was effectively no difference between the two HB’s. With the 2B’s it was close, a little initial smearing but then both erased reasonably well. However, I do have to say that the Staedtler 2B left behind a little bit more of a residual grey smear than the Pentel Ain did. I won’t pass judgement on whether the leads should smear easily or not, but not surprisingly, smearability definitely increased as the grade got softer. So 2B smeared much more than 2H. Both Staedtler and Ain were fairly similar in smearability, but if forced to choose I would say that Staedtler smeared just a little more than Pentel Ain. I guess the one trait that is not debatable is strength. Stronger is better, at least until you reach a point where the leads don’t break in any sort of normal use. After that, extra strength is reasonably irrelevant. Pentel Ain has an impressive reputation when it comes to strength. In 2B, Ain was a bit stronger than Staedtler, and both were clearly weaker than their HB grades. There is a huge leap in strength for Ain 2B to HB, much less of a leap for Staedtler. So Ain HB is significantly stronger then Mars Micro Carbon HB. 2H was slightly stronger than HB, but the difference between Staedtler and Pentel had again narrowed I’m not sure which was the stronger of the two brands. Overall, for Staedtler I am not sure they have reached that point of “strong enough”. I do have some occasional breakages when using Mars Micro Carbon leads. I would rate their strength as “OK” or “Acceptable” rather than as “Good” or “Outstanding” like Pentel Ain. In closing then, Staedtler Mars Micro Carbon leads are good, but they could do with a little more strength in 0.5mm. For 0.7mm and 0.9mm I don’t think there is any issue. 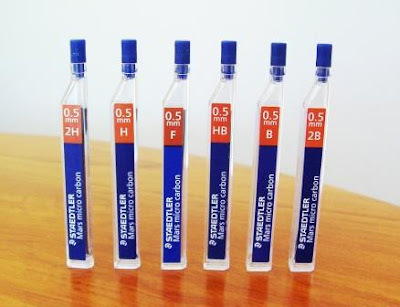 As well as the containers of 12 leads, Staedtler also offer 0.5mm and 0.7mm, 2B and HB leads in a much larger container of 40 leads. This container is a push button dispenser – you push and hold the grey end cap in and leads can then pour out of the conical neckpiece one at a time. Here’s an older version of the container of 12 – it’s the same plastic moulding, just made in opaque blue rather than the current clear plastic, and the labelling is different. In particular the leads are called Mars Micrograph rather than Mars Micro carbon. The actual Staedtler part number is still the same, 250 05-Hardness.